Perhaps the skills of German Frers - a designer well used to the most extreme of sailing boat lines - were really needed to bring life to this super tender with a completely open transom. And, on closer examination, the whole profile of Milonga 35 seems to derive from one of his admired sloops. From the moment the famous artist from Buenos Aires met with his Swedish colleague Ocke Mannerfelt - specialist in off shore competition hulls - a hull was created that will prove to be outstanding. The name Milonga, not by chance taken from an Argentinean tango term, highlights its lively, brilliant, almost passionate character. 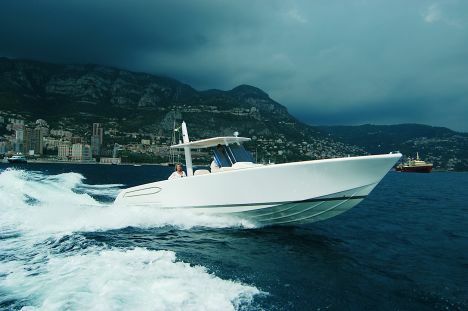 A boat, in fact, that guarantees a maximum speed of 45 knots with a milder engine plant compared to those available (a pair of Volvo Penta D6 310 Diesel) and more than 60 knots with the more exuberant ones (a pair of petrol Mercruisers with 435 hp each), has to be dedicated to those who love exciting experiences. It is the practical, linear, minimalist fittings that further distinguish this hull from most of the super-motorised missiles that - let's be honest - often sacrifice a great deal of comfort in order to produce breathtaking performance. You are instantly struck by the constant quota, for example, of all the surface areas that can be treaded across - from the extremity of the bow to the stern platform - that represents an extremely important practical factor for the most common bathing activities. It is, therefore, a top class tender, capable of quickly and safely connecting the anchored mother boat with dry land, but also an "open" capable of comfortably carrying guests to the cove of their choice for a swim or sandbank to scuba dive. 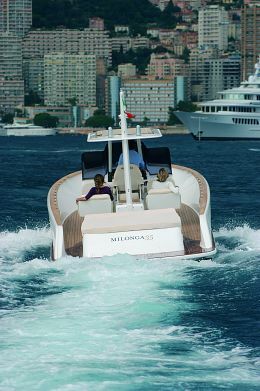 On the subject of prominent use, the Milonga - developed in Argentina, at the Frers family shipyard and completed in Italy by skilled fitters - can be vastly personalised, to the extent that it becomes a small cabined boat. The standard layout foresees a central consol, with wc inside the wheelhouse, six anatomical forward facing armchairs and the driver's seat.